The St. Louis Blues dominated Game 7 last Wednesday night to eliminate the Dallas Stars and advance to the Western Conference Finals for the first time in 15 years. Although that feat won’t go unnoticed, the NHL doesn’t give banners for reaching the halfway point of the playoffs. The Blues will suit up tonight to host the San Jose Sharks, who also had a dominant Game 7 last week to eliminate the Nashville Predators. This will be their first Western Conference Finals since 2011 when they fell to the Vancouver Canucks 4-1. The first two rounds weren’t easy, but the Sharks have a way of not quitting when times are tough. They took out the Los Angeles Kings in five games, despite LA having one of the best goalies in the league in Jonathan Quick. The second round saw them facing the Nashville Predators who gave them a run for their money. Nashville had eliminated the Pacific Division-leading Anaheim Ducks in Round 1 in seven games and forced another Game 7 against the Sharks. San Jose, however, won Game 7 by a 5-0 margin to advance to face off against the Blues. The Blues and Sharks are two teams that have had their fair share of playoff disappointment, but find themselves in the Western Conference Finals. They sit only eight wins away from a Stanley Cup Championship, but still have a long way to go. That’s a lot of pressure for two teams that have never won a championship in franchise history. 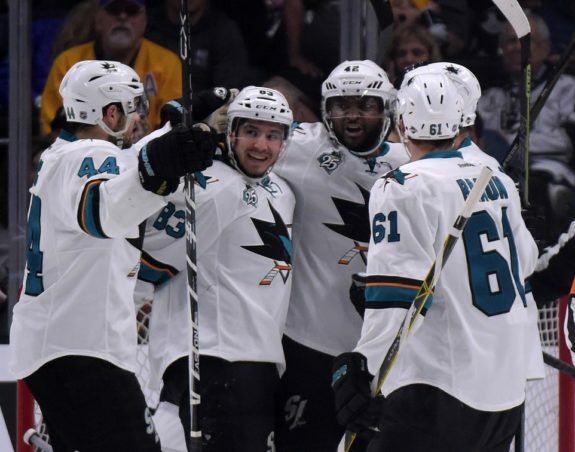 It’s even more pressure considering the Sharks have never reached the Stanley Cup Finals since joining the league for the 1991-92 season and the Blues haven’t been in a Final series since 1969-70. They are two of the top four teams with the longest Finals droughts in the league, but one will inevitably end that streak when this series is over. History aside, this series will be a battle of heavy weights. There will be big hits, game-changing saves and high skilled goals. There may even be a brawl or two. The Sharks are a big team with only four players standing under six feet. They have big bodies with players who can make hits that swing momentum in their direction, but they also have skilled players in the likes of Joe Thornton and Joe Pavelski. Thornton has been almost a point-per-game player this postseason with 11 in 12 games. Pavelski has been over that mark, scoring 13 points in San Jose’s first dozen games. To say the least, if the Blues can stop the two men named Joe, they’ll have a much better chance at advancing. The issue is that two teams have already tried to do so and failed. The Western Conference has been home to seven of the last ten and five of the last six Stanley Cup Champions. It’s a tough conference to get out of and the Blues have a lot of work ahead of them. This is the biggest test of the season for St. Louis and we’ll find out soon enough if they’re ready for it. The real quest for the Stanley Cup begins tonight when the Blues host the Sharks at Scottrade Center. What are your expectations for this series? Leave your thoughts in the comments below.